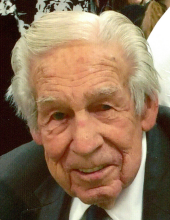 Robert M. Trout passed away peacefully Friday, November 23, 2018. He was born November 13, 1924 and was preceded in death by his wife Joyce, and sons Daniel and Michael. He is survived by his daughters Deborah and Judith and many grandchildren and great-grandchildren. Bob was always very active. He loved watching Cleveland Indians games, farming, growing a garden and cutting firewood for his wood stove. He loved having friends drop by for coffee. He would sit out on the porch or by his wood stove in the winter. Bob was always the type of person who people felt comfortable and drawn to by his kindness. He was always a great father. He taught his children the importance of hard work, honesty and loyalty. He was a member of the Jehovah’s Witnesses his whole life. He looks forward to being joined with his family in the earthly resurrection that Jehovah God promises in his word the Bible. To learn more about this go to the website JW.org . There will be a memorial talk December 15, at 4:30PM at the Brunswick Kingdom Hall of Jehovah’s Witnesses, 3906 Sleepy Hollow Rd., Brunswick, Ohio. "Email Address" would like to share the life celebration of Robert M. Trout. Click on the "link" to go to share a favorite memory or leave a condolence message for the family.